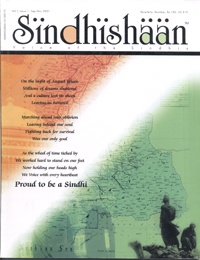 Thanks to you for your letter of April 24th and copy of the first issue of Sindhishaan. The get up, the production and the contents of you issue make a significant impact. I am sure that with the passage of time and greater experience and will to sustain the initiative, Sindhishaan will record greater heights. I would be pleased to offer whatever support I am capable of providing whenever called upon to do so.